Daahlings, daahlings, gather round. An important piece of fashion news has fluttered my way, and it seems best to pass it on. I heard that it’s considered a bit of of a faux pas these days to be too matched. You know, ensuring that the colour of your shoes complements hat and gloves and the like. All much too démodé to modern taste, isn't it? So banish the twinsets and bring in the clashing patterns! I like the occasional fluffy outburst of Absolutely Fabulous inspired sentiment. Somehow the use of ‘daahling’ allows every word that comes after it to walk the right line between sweetness and sarcasm. The style-snobbery shown above is entirely imagined, but is the kind of thing I can picture Eddie saying in a melodramatic tone while waving her hands about. The outburst was inspired by some idle research into ‘matchy matchy’ – a term I had thought was as vintage as the contents of my wardrobe. However, Google corrected my assumption. Apparently it was added to the Oxford English Dictionary in 2010 after popping up like a well-dressed rash across various fashion blogs. It had lingered in the industry long before that, but rose again when aired on the internet. It's a clever term, the double use of the word 'matchy' echoing the practice of repeating a colour, pattern or texture in an outfit. Yet it's often used to belittle or pass judgment. A search for the phrase “too matchy matchy” yields any number of style rules stipulating avoidance of such a fashion gaffe. This sentiment is then exemplified on catty gossip websites picking apart ‘celeb’ style choices. God forbid there was some continuity between accessories! Others have revelled in it. The term was pulled from the pejorative pile in this article by Jess Cartner-Morley from 2012, while according to Bethan Holt matching two-pieces has surged again for AW13. My motto is "wear what you want, when you want", but there is a strange fascination in charting the wax and wane of trends such as this. I don’t know what the historical precedent is for the practice of matching clothes. Great to envisage the first fledglings of mankind discovering the unity of bone bracelets, necklaces, anklets, nose rings and other forms of adornment, or using leftover scraps of animal hide for some matching (and pretty fetching) slippers to keep feet warm in the caves. However, that's all sounding much more Flintstones than factual history. The common images of what we might term ‘matchy-matchy’ tend to apply to the last century. It suggests fifties' housewives dressing daughters as smaller versions of themselves and men with socks and ties of the same colour. But perhaps where it was usual then – part of a more uniform decade where suits and smart clothes were expected – today it is a choice. Now the concept of "match-matchy" can be manifested in various ways. There is the subtlety of red lips reflecting a belt or a bag or brooch (or for a select few the bottom of a pair of Louboutins). Then the gradation of scale slides from something such as bold-but-elegant matching shirts and shorts, through to the scrumptious outlandishness of every item worn inhabiting the same part of the colour spectrum. Going further still is finding someone else whose clothes will mimic your own, like this couple who have worn matching outfits for the past 35 years. Seeing two people dressed similarly is always intriguing. Was it deliberate? For what purpose? Does it work as a look? Sometimes it is just fluke. I once turned up to meet my friend Merlin, only to realize that my purple blazer and velvet black trousers resembled his purple jumper and black trousers a little too closely. At least we looked eye-catching. 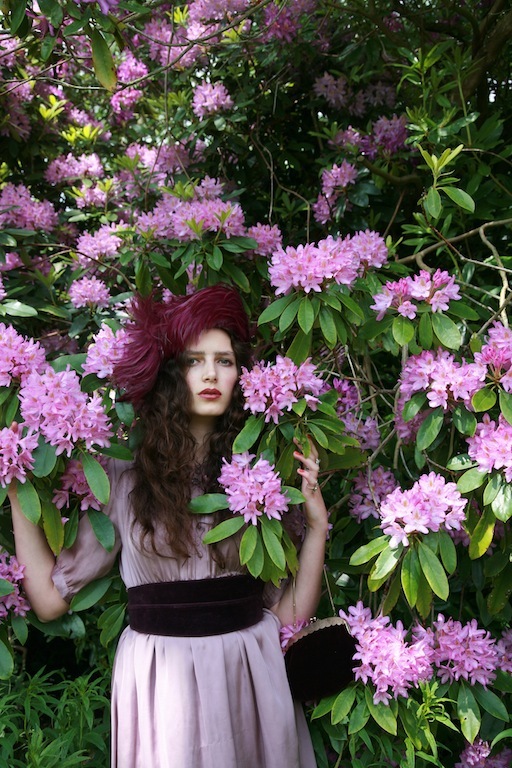 Here I began with the rhododendrons and matched my clothes accordingly. I went from toying with the simplicity of the silk dress to piling on all the shades of purple I owned. From mauve tights to plum coloured boots to the vintage feather hat, it was an exercise in unrestraint and luxurious fabrics. All items second hand, with a slight clash of colour provided by the Chanel lilis nail polish. Absolutely stunning! I love your style, and the way you write too. I'd never heard the term until I started blogging four years ago so it doesn't surprise me. After years of corporate dullness I cannot abide anything looking too coordinated and I stopped buying clothes retail when friends went out and bought the same, if we were meant to dress identically we'd all have been born looking the same! Fantastic look. The colors and hat are spectacular! Your writing is absolutely beautiful – I truly enjoyed reading this post! Those photographs are lovely. I find it so dull that according to 'fashion' we are supposed to all follow rules about how to dress: matchy matchy or its opposite are both equally soulless if adopted to look 'on trend'. I suppose those rules about what to wear are useful for people who hope to gain a sense of confidence and the safety/acceptance that comes from looking like our peers. You dear Roz, look radiant, in part because you've clearly just followed your instincts with this great ensemble, done it your way. The colour is magical on you and I love that hat so much! Beautiful outfit, yours and yours alone! WOW. :)) I like this monochrome styling. Beautiful photos. Looks like something out of a fairytale. LOVE your matchy outfit, in particular your feathered hat! I like monochrome but poly-textured, faux pas or not.